Towards the end of last year, Nick Frost started some rumblings that said the final installment of the Three Flavours Cornetto Trilogy, also known as the Blood and Ice Cream Trilogy, just might shoot next year. 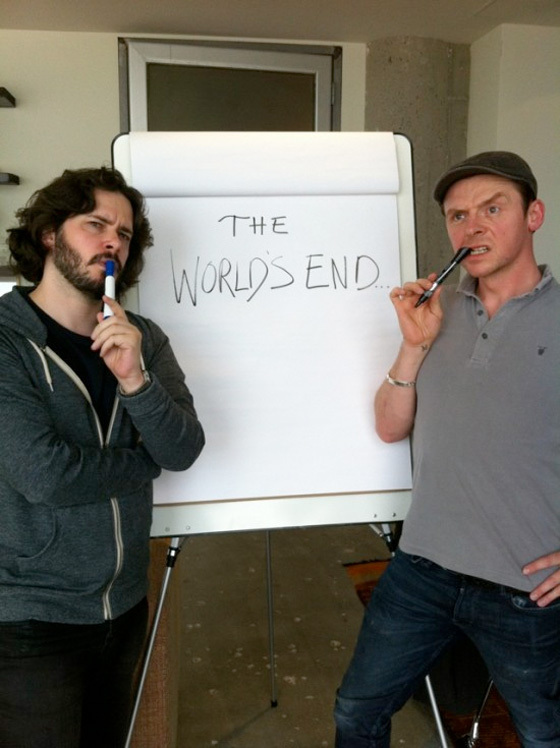 The World's End has been anticipated for some time, and now it sounds like Shaun of the Dead and Hot Fuzz star and director Simon Pegg and Edgar Wright are working on the script, or at least getting started on plotting the film. A new picture has showed up through Wright's Twitter feed with only the words "Hard at work," to accompany it. Sounds like it's time to start getting excited, folks! See the photo below! Frankly, I can't wait to finally wrap up this so-called trilogy. Shaun of the Dead and Hot Fuzz are easily some of the best comedies to hit the big screen in the last decade and anything Frost, Pegg and Wright put together will have my full attention. It'll be interesting to see two different kind of apocalyptic comedies hit theaters with The Apocalypse from Seth Rogen and Jay Baruchel also gearing up for production soon as well. It's 2012 after all, so it seems like the best time to be coming up with end of the world scenarios. We'll just have to hope the Mayans were wrong so we can actually see these films eventually. Who's excited? Oh yeah, these are those Edgar Wright films that actually make money. Can't wait! Defintely excited, Shaun of the dead is my favorite film of all time.